"We begin this review with a full disclosure. I write notes on occasion for the booklets that accompany Immortal Performances' releases, and in fact wrote the notes for the LUCIA performance in this release. There is no payment of any kind for these notes (other than a couple of complimentary copies of the recording). One reason that I don't accept payment is to remove any suggestion of a conflict of interest in reviewing their products. I believe it is important explicitly to state the facts here so that the reader can make up his or her own mind. 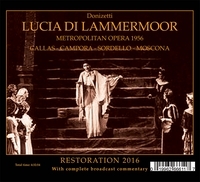 Because I wrote the LUCIA notes for this set, I am reviewing only the MEDEA, something I asked to do because of the unique importance of this performance in the Callas catalogue and the remarkable quality of Richard Caniell's restoration. 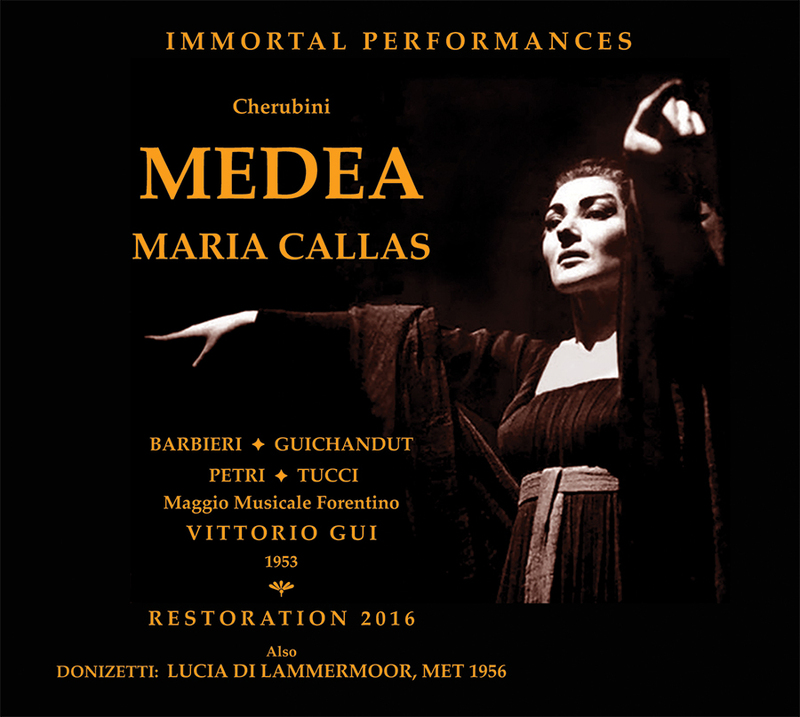 This MEDEA is the earliest of six recordings of this signature role for Callas. The others are (with conductor and tenor listed): 12/10/1953 La Scala performance / Bernstein/Penno; 9/12-19/1957 Studio recording / Serafin/Picchi; 11/8/1958 Dallas performance / Rescigno/Vickers; 6/30/1959 Covent Garden performance / Rescigno/Vickers; 12/14/1961 La Scala performance / Schippers/Vickers. There are quite a few reasons to prefer this recording, though they have not been evident before because of the terrible transfers in circulation, particularly on Fonit Cetra, Arkadia, and Melodram. Immortal Performances provides a fuller, warmer, more natural sound throughout, and the longer one listens the more gratifying that becomes. For the first time we hear the glory of the young Callas taking on this role that was to become so strongly identified with her. In one spot in the last act, when Callas was upstage on the stairs and completely off-mike (she is virtually inaudible in the other transfers), Caniell has substituted the passage from the Bernstein performance in order to make her audible. One would not notice if he had not said so in his notes. There are certainly significant strengths to later performances, particularly the 1959 Covent Garden in Pristine's superb transfer. Callas' ability to dig more deeply into the role after living with it for six years is clear, and she was still in good voice in 1959 (though not as free as here). And, of course, there is the towering Giasone of Jon Vickers. However, there is a significant negative to all of those later live performances - the issue of cuts. Gui opens a number of cuts observed by Bernstein, Serafin, Rescigno, and Schippers, including the final section of Medea's 'Del fiero duol'. And although it is true that Callas found a wider range of color and inflection for her later performances, it is also true that she hurled herself into the role with an intensity and an uninhibited passion here that she never matched again. This Medea is a woman consumed by rage, inflamed by passion, teetering around the edges of madness. In no performance have I felt that madness as I have here. And the complete freedom and control of the voice that she has here is breathtaking. (The studio recording, made for Ricordi and issued on Mercury first in the U.S., is the weakest of all, an oddly ineffective performance all around). I am not sure that I have ever heard a characterization on an operatic stage with a greater sense of unbridled emotion. The range of vocal colors available to Callas, and the imagination to employ them, is without parallel. The degree to which she throws herself into the role, particularly in the last act, is almost frightening. The disgust and rage she hurls at Giasone, done with a voice still in its youthful prime, is the extreme of operatic thrill-giving. Gui also performs music for other characters that is cut elsewhere, so here we have a more complete MEDEA than is found on many of the off-the-air recordings not only by Callas, but by Olivero and Gencer as well. Barbieri's Neris benefits in particular from Gui's editorial choices. Gui is to be admired as well for the dramatic urgency of his conducting, for his permitting (probably even encouraging) the white heat of Callas' singing. Together they achieve something even beyond Callas and the young Bernstein and beyond Callas and Rescigno. If I had to choose a single act of a Callas performance to demonstrate to someone unfamiliar with her art just what made her unique, it would quite probably be the final act of this performance of MEDEA. Guichandut sounds rather ordinary at the outset, but one gets the feeling that he recognized the greatness taking place around him, and his performance grows in stature as it goes along. By the third act he is a significant force, singing with tonal heft and with passion. Barbieri is a splendid Neris, and as indicated above the role gains in stature from [Gui's inclusion] of cuts. Tucci is luxurious casting as Glauce, and only Petri falls to the level I would call ordinary. This performance of MEDEA has never had the stature it merits because of the inept quality of earlier transfers. The audience at the Florence May Festival in 1953 knew what it was hearing, and Immortal Performances' decision to retain the first three minutes of the ovation at the opera's end allows us vicariously to experience their enthusiasm. It borders on delirium, and one can understand why. It is impossible to minimize the importance of Pristine's transfer of the Covent Garden performance with Vickers, but it is equally impossible to minimize the importance of this transfer of a performance by a young Callas at the top of her game, performing music that was cut from future performances she gave. Immortal Performances has achieved quite a reputation for the quality of its accompanying booklets, but this may exceed even its high standard because of Caniell's separate appreciation of 'Callas, La Divina'. In a highly personal but deeply knowledgeable essay, Caniell explores the unique art of Maria Callas in a way that enlightens and informs. In addition, he has written an extraordinarily insightful exploration of MEDEA and of this particular performance. Both booklets ('La Divina' is its own booklet) have wonderful photos; those of Callas as Medea are thrilling additions. For many years I thought that this MEDEA was unnecessary to anyone but the Callas completist. I now know how wrong that viewpoint was. It is essential to a full understanding of her art, and it is simply one of the most thrilling operatic performances I have ever heard." 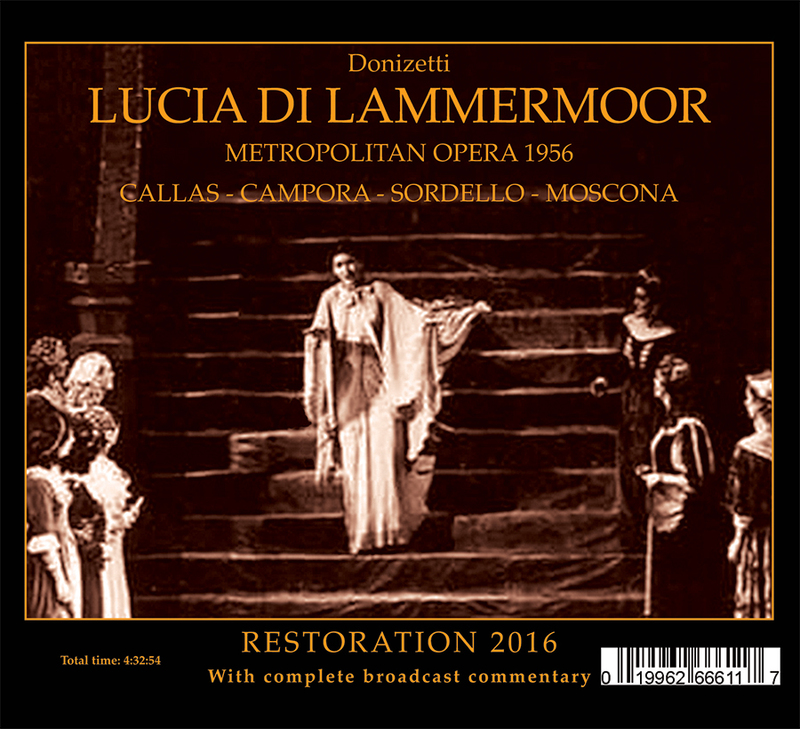 "Since my colleague Henry Fogel wrote the appreciation of the LUCIA DI LAMMERMOOR, included in the liner notes accompanying this Immortal Performances four-disc set, I have been given the task (more accurately, the pleasure) of reviewing that portion of the release. Maria Callas' career at the Metropolitan Opera was far too brief, comprising performances from 1956 to 1958, and a pair of TOSCAs in 1965. The December 8, 1956 LUCIA proved to be Maria Callas' only Met broadcast. As such, it is an important document, but not one free of issues. It is true, as John Ardoin famously noted in his book THE CALLAS LEGACY, that the legendary soprano is not in her finest voice for the broadcast. High notes are a particular challenge, with many being cut short after the initial attack, and the pair of climatic E-flats in the 'Mad Scene' altogether omitted. There is also the occasional, but noticeable, insecurity in the passaggio from the middle to the upper registers, with corresponding pitch issues. That said, Callas was at the height of her career when this broadcast took place, and there is much to savor. Henry Fogel documents these strengths in his warm, insightful, and beautifully written essay. Even at less than her vocal best, Callas was a singular and amazing Lucia, one who, perhaps like no other, masterfully portrayed a three-dimensional, fragile young woman who is a single horrible turn of events away from madness. While listening to this broadcast I frequently thought of an analogy to performances by tenor Carlo Bergonzi during the latter stage of his career. Yes, the high notes were a challenge for Bergonzi during that period, but every other aspect of his vocalism was a masterclass in the art of Italian tenor singing. And that is very much how I feel about Callas' Met broadcast Lucia. In every measure of the score, Callas understands how to declaim the text, and to shape the color of the words and music to embody Lucia's plight. It is the essence of bel canto: beautiful and refined singing, always at the service of the drama. Callas' colleagues on this occasion - Giuseppe Campora as Edgardo, Enzo Sordello as Enrico, and Nicola Moscona as Raimondo - are in good voice, and do not let the[ir] side down. Fausto Cleva leads an incisive performance, and one clearly in sync with Callas when she is on stage. Richard Caniell has located a fine source for this broadcast, and the Immortal Performances remastering has fine definition and ample dynamic range. In addition to Henry Fogel's essay, the booklet contains a synopsis, and Richard Caniell's Recording Notes. The broadcast also features Milton Cross' commentary, and general manger Rudolf Bing's backstage conversation with the LUCIA cast, including a very warm and humble Maria Callas. Any exploration of Maria Callas' unique Lucia should begin with her 1953 EMI studio recording, supplemented by the incandescent 1955 Berlin live performance led by Herbert von Karajan. But the 1956 Met broadcast has its own appeal and is, I think, a worthy supplement. Some collectors may know this Callas MEDEA from Fonit Cetra Documents LP and Instituto Discografico Italiano releases, but the difference in sound here puts this release in another league entirely. The Overture in Immortal Performances' transfer sounds fabulous, with nice body to the orchestra, moving on with a sense of inevitability, imbued with the force of Greek tragedy. Gui's conducting might nowadays be termed unstylish - but it is always powerful. The Introduction to the second act is the perfect reflection of Medea's agitation. The sense of tragedy suffuses the whole, including the lyric moments, and it is this reading that is Gui's central achievement. When we reach the end of the first act it is as if the applause's sole purpose is to release the build-up of tension. He shapes the long wedding ensemble in the second act brilliantly, the chorus making a massive impact across the years, the tension ratcheted ever onwards. The torrent of applause that concludes Act II justly is deserved; the sheer frenzied dynamism of the Prelude to the third act gives hints of what is to come. The close of the opera is a headlong fall into chaos, and beautifully done. Callas herself is chilling, as her Act I confrontation with Petri's Creon proves without doubt. It is in her later solos in Act I that she reveals the range of expression available to her, beautifully shading lines one moment, then delivering them with a core of steel the next. The long scene with Creon in Act II is stunning, not least because Mario Petri's staunch determination meets Callas' imposing presence full on. But it is in the final act that Callas comes completely into her own. 'Numi, venite a me' begins from a place of imperious command, and she builds from there. One really gets the impression that from 'Tu Glauce piangi sol' there is an unstoppable momentum. Gui inspires his orchestra to the most powerful expressions of tragedy, a fitting match for Callas. Gui also includes as much musical material as possible (many other conductors were very liberal with their cuts). It is important to honor the fact that Callas, stratospheric though her stardom may be, is not the only singer here who can move the listener deeply. In 'Solo un pianto', Fedora Barbieri as Neris is simply glorious. One wonders if that brought Callas to even greater heights, for her scene thereafter ('Creonte a me solo') is the epitome of Callas at her very greatest. Gabriella Tucci herself cuts a vocally a formidable figure as Glauce. Mario Petri is somewhat distanced at his first entry, yet he clearly has dramatic presence, and, as 'Pronube dive' proves, no mean legato either. As Giasone, Carlos Maria Guichandut is strongly focused. The problem with microphone placement meant that some of Callas' words are lost as she goes downstage at the end of Act III, so Caniell has inserted part of a later 1953 performance. Callas' 1958 Dallas performance of MEDEA may be more famous, and includes some nuances not heard here, and the December 1953 Scala may be the most famous, but there is a ferocious identification with Medea here that is unbending; and one should not imply that subtlety is absent here. Callas as Medea does have something of a life-changing impact on the listener. The LUCIA begins not only with the familiar tones of Milton Cross as announcer, but also with Maria Callas speaking to her radio audience (she tells us she hopes she will please us). Other singers from the case send their regards, with Italian and Greek added to the linguistic mix; Rudolf Bing is there, too. This is in fact Callas' only Met broadcast. This might not be the finest Callas Lucia, and she cuts several high E-flats, including two in the 'Mad Scene', but it has massive historical value. The conductor Fausto Cleva sounds very much on home turf in the opening Prelude, and marshals the opening chorus well (the Met Chorus was in lusty voice). Cleva delineates the varied surface extremely well; the carefree opening to Act II, scene 2 being a case in point. He also steers the famous Act II sextet beautifully. The sound reproduces the orchestra well, notably perhaps the harp in Act I, scene 2 and the horns at the opening of the Second Act. Voices, too, have a lovely bright gleam, something perhaps heard at its best in Callas' upper registers. Callas and Votipka are a brilliantly coupled pairing, Votipka preparing the way superbly for Callas' aria 'Regnava nel silenzio', itself brilliantly dispatched. Perhaps the end of Callas' scene, prior to the arrival of Edgardo, holds a not quite resplendent crowning close, but the interpretation remains compelling; one could easily argue that the human element raises it above any studio assumption. The 'Mad Scene' (Act III, scene 1, 'Il dolce suono') begins with Callas projecting a fragile, tragic demeanor; as the scene unravels (if you'll pardon the expression) Callas' vocal fireworks become an integral part of her dramatic vocabulary. Not allowing ourselves to get fully dragged into her torment - one can appreciate Callas' magnificently considered phrasing; and the famous passage with flute is exquisite. The role of Edgardo is taken by Giuseppe Campora, who is meltingly eloquent, strong of voice and impeccably clear of diction. The parting duet of Callas and Campora at the end of Act II, scene 1 is particularly well matched, and the phrasing of the two of them in octaves, shadowed by silken strings, is a thing of joy. The last section of the Opera (Act III, scene 2) falls mainly to Edgardo, of course, and from his suavely phrased first entry ('Tombe degli avi miei') it is clear this is the best of him. The strength of his voice is very clear, and the phrasing of 'Tu che a Dio' accompanied by subtly shuffling strings, is the perfect way to close the oper....There are a million reasons to obtain this set."